Every major tech platform denies that it censors content; but none of them are telling the truth. 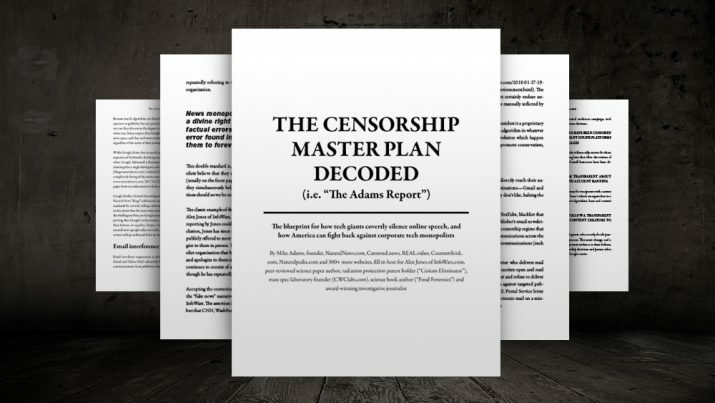 Evidence has amassed to show that all the big players – Twitter, Facebook, Google, YouTube, and others – are actively engaged in covert silencing techniques against conservative and Christian voices. • Twitter is the worst when it comes to censorship. While it remains President Trump’s go-to platform for speaking directly to the people, Twitter is said by Project Veritas to be the worst social media platform for censorship. Company staffers admitted on hidden camera that they routinely “shadow ban” users, while accounts that mention things like “America” and “God” are being actively stymied. During the 2016 presidential election, Twitter tried to manipulate election-related tweets associated with truth hashtags like “#PodestaEmails” and “#DNCLeak.” Twitter also prohibits advertising for pro-life groups like Live Action, and even from pro-life Representative Marsha Blackburn (R-Tenn.), but fully accepts ads from abortion mill Planned Parenthood. • Facebook’s trending feeds actively hide conservative topics. Similar to Twitter, Facebook also goes through and removes conservative content from it’s “trending” section, which is supposed to populate news stories based on user interest. But we now know that Facebook employees are simply hiding topics and people they don’t like, including Rand Paul and the Conservative Political Action Conference (CPAC). On the flip side, Facebook was caught adding leftist topics like “Black Lives Matter” to its trending section, even when this phrase wasn’t actually trending. A conservative organization based out of Europe was also banned from Facebook without cause, the Zuckerberg enterprise offering no viable explanation as to why. • YouTube is actively removing conservative channels and videos. Part of the reason why we launched REAL.video is to address the ongoing video “burning” that’s taking place at YouTube. The Google subsidiary has been busy pulling down videos and channels that have anything to do with right-wing political views, such as those that even just mention guns or the Second Amendment. • All the major tech platforms are in lockstep with far-left extremist groups. If you look closely, you’ll find that Google, YouTube, and many other tech pages are closely aligned with far-left extremist groups like the Southern Poverty Law Center (SPLC) and the Anti-Defamation League (ADL). The George Soros-funded group ProPublica is also involved with this Big Tech fascism, working with major social media platforms to target conservative groups such as Jihad Watch and ACT for America. • Twitter’s “Trust and Safety Council” is made up almost all liberals. The people who create policy and guidelines at Twitter are almost all liberals, it’s been revealed. While 12 of the 25 U.S. members of Twitter’s “Trust and Safety Council,” as it’s called, are liberals, there’s currently only one conservative offering input into how Twitter runs its platform. • Almost all “fact-checking” services used by Big Tech are biased against conservatives. Just like Snopes, many of the so-called “fact-checking” services used by tech platforms to allegedly combat “fake news” are biased against conservatives. They’re less concerned with uncovering truth, and more concerned with pushing the status quo. Be sure to read the full report at NewsBusters.org.